Pustak Ka Vivaran : hindee mein vibhinn dishaon mein suprasiddh lekhak param vidvaan bhee raameshvar jis adhyann khoj aur parishram se yah likha hai atyant prasanshaneey hai. hast saamudrik shaastr samast sansaar ko bhaarat ke praacheen manipiyo kee ek apoorv den hai vidvaan lekhan ne haath kee praayah patyek rekha ko prthak prthak roop mein bhinn bhinn chitron ke dvaara samajhane ka kaary kiya hai…………. 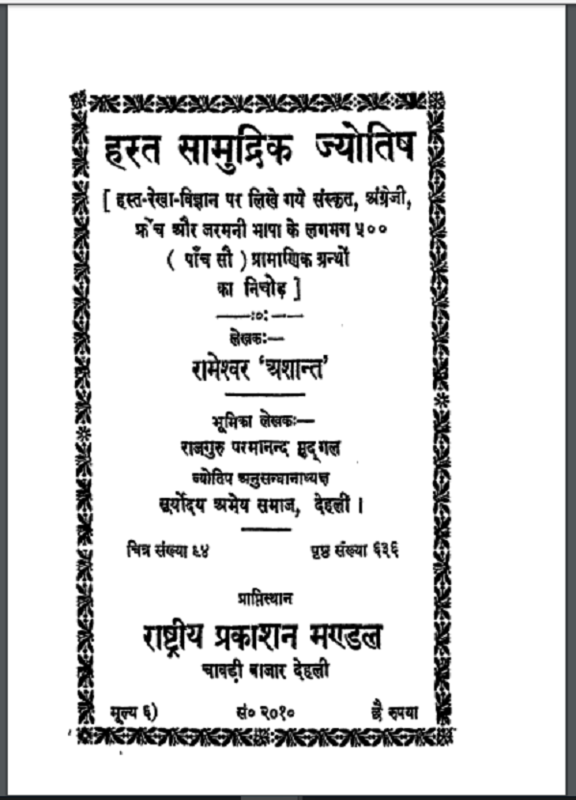 Description about eBook : In the various directions in Hindi, the famous author, the great scholar, Rameshwar, which is written by this great discovery and diligence, is highly preserved. Handcrafted science is an indescribable contribution of ancient Manipo to all the worlds. Writing of scholarly writings has often been done to understand each and every line of hand through different pictures in separate form……………..